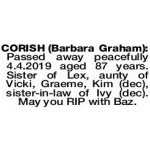 A celebration of Barbara's life will be held on SATURDAY (13.4.2019) at 2.30pm. For address details please contact Peta on 0450 627 855. 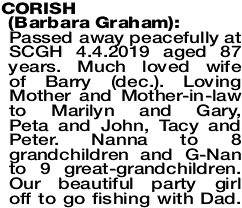 BARBARA GRAHAM Passed away peacefully at SCGH 4.4.2019 aged 87 years. Much loved wife of Barry (dec.). Loving Mother and Mother-in-law to Marilyn and Gary, Peta and John, Tacy and Peter. Nanna to 8 grandchildren and G-Nan to 9 great-grandchildren. Our beautiful party girl off to go fishing with Dad. You lived a wonderful life full of love, happiness and good times. Love you always. Peta, John, Gemma, David James, Carly, Josh, Griffin, Emmett, Romae, Adelle. 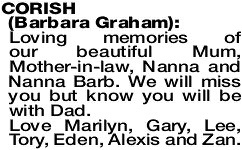 BARBARA GRAHAM Loving memories of our beautiful Mum, Mother-in-law, Nanna and Nanna Barb. We will miss you but know you will be with Dad. Love Marilyn, Gary, Lee, Tory, Eden, Alexis and Zan. Passed away peacefully 4.4.2019 aged 87 years. Sister of Lex, aunty of Vicki, Graeme, Kim (dec), sister-in-law of Ivy (dec). May you RIP with Baz. 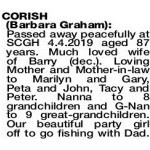 CORISH BARBARA Heartfelt sympathy to Marilyn and Gary, Peta and John, Tacy and Peter and families on the sad loss of Barb - a wonderful lady. Thank you dear friend for the lovely memories you have left us. We shared so many happy times over many years. Dear Marilyn, Gary, Peta, John, Tacy, Peter and families, our love and thoughts are with you all. Rest in Peace. Vince, Fay and families. 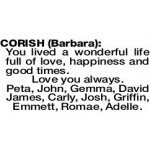 CORISH BARBARA Farewell to our loved and respected friend. Heartfelt sadness to daughters Marilyn, Peta, Tacy, also son-in-laws and families. 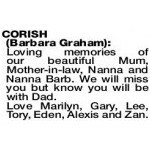 Barb you were such enjoyable company and always welcoming. Those fun times had passed but memories remain forever with us, Noela Andrew Torryn.